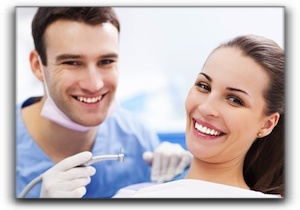 General Dentistry in Bloomington | What Can Our Practice Do For You? Hello, and welcome to the Bloomington dental health blog. Today, we want to take some time to tell you about our Bloomington practice, Create A Smile, PC – Dr. Ken Moore. We serve residents and patients of all ages in the Bloomington, Ellettsville, and Bedford area. Our friendly staff is here to help you achieve a healthy smile and to improve the appearance of your smile with general dentistry in Bloomington. Along with healthy teeth and general dentistry in Bloomington, many of our local dental patients want to know more about popular cosmetic dentistry procedures that could make them look and feel young again. These include teeth whitening, veneers, dental implants, gum contouring, and dental crowns! A combination of cosmetic dental treatments can remedy every problem you might be experiencing to achieve your brilliant smile. Don’t let yellow teeth and or a cracked tooth keep you from a healthy smile! If you live in the Bloomington area and would like to see what Create A Smile, PC – Dr. Ken Moore has to offer, give us a call at 812-332-1405. Our dental practice is currently accepting new dental patients. We are located at 219 E. 17th St. in Bloomington, Indiana and we have been serving the dental patients of the Ellettsville and Bedford area since 2001. Our friendly dental team can’t wait to make you our next satisfied patient. Contact us today! Smile Makeover in Bloomington | Do You Love Your Smile?